Israeli Prime Minister Binyamin Netanyahu will likely serve a fourth term after this week’s general election, but many of the details of the new government are still up in the air. Israel’s parliamentary government has a proportional electoral system, where each political party receives seats in the 120-seat central parliament, the Knesset, equivalent to the percentage of votes they win in the national elections. But with 26 parties vying for votes, no single party has ever won at least 61 seats, or enough to form a majority government on its own. Instead, parties form coalitions with one another to gain at least 61 seats, a negotiation process that can take weeks. After the initial election, the largely-ceremonial Israeli President, currently Reuven Rivlin, asks the heads of all parties that won seats who they will coalition with, and then announces who is in charge of forming the governing coalition. This week’s election process began in December of last year, when Netanyahu, who still had more than two years left in his third term, fired two of his cabinet ministers and called for early elections. At the time, Netanyahu’s governing coalition consisted of five parties: his own right-wing Likud Party and four others, mostly conservatives. Other members of the governing coalition had been increasingly critical of Netanyahu, particularly Finance Minister Yair Lapid and Justice Minister Tzipi Livni, the ministers Netanyahu fired. The coalition’s instability appears to have been a major factor in Netanyahu’s call for early elections. Despite Netanyahu’s confidence in re-election, the center-left Zionist Union party gained rapid support in the polls. The Zionist Union, a pact between the Labor Party, led by Isaac Herzog, and a liberal movement known as Hatnuah, formed by former Justice Minister Livni, had made domestic policy a focus of its campaign, emphasizing rising income inequality, housing prices, and the cost of living. It has also promised to repair relations with the international community, particularly the Palestinians and the United States. Likud, in contrast, has campaigned primarily on foreign policy issues, portraying the Zionist Union as unable or unwilling to challenge Islamic militants and Iran’s nuclear program. The most recent pre-election polls showed the Zionist Union on track to win at least a four- or five-seat lead over Likud, which was projected to win a mere 20 seats. The subject of Arab-Israeli voters has been central to this week’s elections, as a new party, the Arab Israeli Joint List, shattered all expectations to emerge as the third largest party in the Knesset. 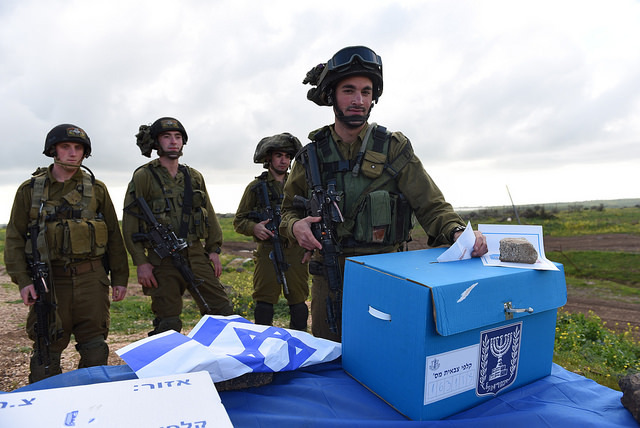 In order to limit the representation of extremist parties, Israel has required parties to receive at least 2% of the vote in order to gain at least one seat in the Knesset. The head of Israel’s ultranationalist Yisrael Beiteinu party, Avigdor Lieberman, who has advocated for the creation of loyalty oaths for Arab Israelis, introduced legislation to raise this threshold to 3.25%. This threatened the survival of four small Arab parties, which joined together to form the Joint List. Projected to receive 13 seats in the Knesset, it in fact received 14, making it the third most powerful party after Likud and the Zionist Union. Despite this, its leader, Ayman Odeh, has pledged not to form any governing coalition. However, the Joint List has indicated support for Herzog over Netanyahu. As the dust settles, Netanyahu and his Likud Party appear to have won a decisive victory. Despite the pre-election polling data, Likud has received 30 seats in the Knesset, compared to only 24 for the Zionist Union. Netanyahu has already approached the Jewish Home Party, which earned 8 seats, as well as Lieberman’s Yisrael Beiteinu party, which barely cleared its own 3.25% threshold, earning a mere 6 seats. He has also approached several ultra-orthodox parties and a new centrist party, Kulanu, which received ten seats. Any governing coalition will also have to appoint ministers to various government agencies; this can complicate negotiations, as parties often demand key governmental positions in return for joining a coalition. For example, many observers have speculated that the leader of Kulanu, Moshe Kahlon, will join the coalition if Netanyahu makes him Finance Minister. Netanyahu’s troubles, however, are far from over. Several right-wing parties have shown dissatisfaction with Netanyahu as a candidate, and while many governing coalitions rotate the prime ministerial position, Netanyahu has been unwilling to share power. It is possible, though unlikely, that his parties will form a government without him. Furthermore, Netanyahu’s new coalition will probably have even more parties than the last one, which was already highly unstable. If he is able to cobble together another governing coalition, however, it will be considerably more religious and right-wing than the previous one, a function both of Netanyahu’s personal shift to embrace far-right positions on settlements, the two-state solution, and Arab-Israeli rights, and of the positions of the Jewish Home and Yisrael Beiteinu parties. Tensions with the international community will almost certainly continue to rise, with chief Palestinian negotiator Saeb Erekat pledging to respond to a new Netanyahu-led government by accelerating efforts to accuse Israel of war crimes at the Hague. It may also impact President Obama’s negotiations with Iran over its nuclear program, talks which Netanyahu has strongly opposed. Lastly, any potential governing majority will likely place Israel in conflict with the European Union, which has been weighing trade sanctions on Israel over its settlement policy in the West Bank.